Learn how to avoid problems with miscellaneous construction materials in tropical climates. This course is intended for mechanical, electrical and architectural engineers and other design and construction professionals wanting an introduction to the special challenges present in building mechanical and electrical systems in facilities in tropical climates where heat, humidity and seafront conditions are important. This course will give mechanical, electrical, architectural, structural and civil engineers and other design and construction professionals an introduction to tropical engineering of building mechanical, electrical and miscellaneous building systems and features.. 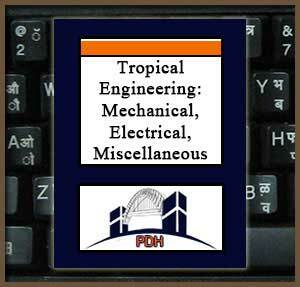 This is an introduction to methods for design and construction of building mechanical and electrical systems in tropical climates. This course will give you technical guidance you can apply when designing building mechanical and electrical systems in the tropics.